Devdas: Hello, I'm Devdas, a.k.a. 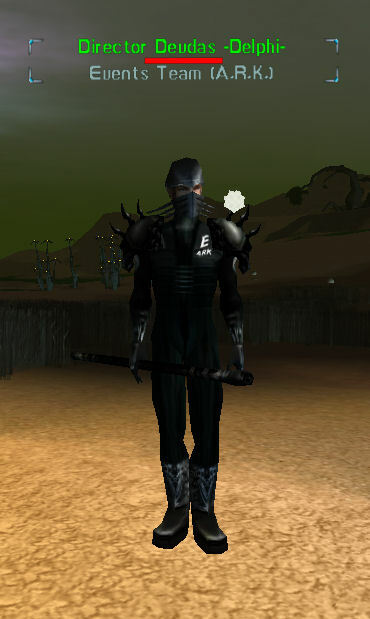 "The red eyes covered in shadows" as well as a long list of blue names known to every roleplayer in Anarchy Online. I help a bit in Funcom's volunteer programs. Within the Advisors of Rubi-Ka (or ARK for short) I'm currently the Director of the Events Team. My duty is to take care of all the administrative stuff within such an organisation, plan events, help my people with questions, be in contact with the roleplay community of Anarchy Online, act in our Events, play an assortment of different Characters, doing way too many paperwork and probably some more stuff I tend to forget anyways. AOU: When did you join ARK and at what point were you promoted to the position you currently have? Devdas: Guess that's quite some time ago by now, must have been around mid June 2004. ...More than 4 and a half years. Aside from my initial training I have spent the whole time without any breaks with the events Team. I took over my current position as Director from a long list of predecessors mid April 2007. AOU: Were you looking forward to Legacy of the Xan, both from your role as Event's Team Director, and as a gamer. Is the game going to bring more events, and better gameplay, in your opinion? Devdas: As there are currently many things outside of Anarchy Online that keep me busy, I didn't have any time to really look into that one. The thing that attracted me to Anarchy Online and fascinates me up to this very day, is its awesome story, the incredibly deep, detailed and complicated lore. And I'm confident that the new content will continue to tell the story of Rubi-Ka in that awesome, AO-typical way we all love so much. AOU: Is Events Team well staffed, and how well are they doing? Devdas: There can never be enough people in Events. But over the last roughly one and a half year we have a rather stable number of members in the events Team and are running quite smoothly, only changing minimal with he usual seasonal tide. Of course there are always little things one can try to optimize. AOU: What is the current status of the RSS? do you have enough editors? how long does it usually take for an article to be published? Devdas: That depends, usually we are able to edit a submitted article within 24 hours. Unfortunately there are as good as no players that submit articles, this year I believe we got articles from two different players. Recently there were many articles of a questionable quality or with questionable content. If an article takes a long time to be published, than this is mostly due to the fact, that the events team can't really decide if we should or should not publish the article. AOU: The RSS PDF manual states reporters are required to be level 100, will you consider eliminating this requirement? Devdas: That is an interesting idea, we will discuss that detail in the team and see if we want to change it or not. It might help to get one or two more players to write articles. AOU: Would you consider promoting the player-run publications like Rubi-Ka Times, Newland News and Perseus Spiral News through the Editor News forum? Devdas: As these great publications are player run and therefore third party we will not be able to promote them ourselves via the editor news. We only can (and should have for most) list them in the Beginners Guide to RP and Events on the forums. AOU: Does your team also write and provide events for the German server? Devdas: Yes, Die Neue Welt, Funcom's Server for the German speaking community of Anarchy Online, is supported by my team and me just in the same way as Rimor and Atlantean. Devdas: The best way to get into RP is to rp. Meet with your friends and play out your stories. To get to know other roleplayers within Anarchy Online I would suggest to join one of the RP-Chat-Bots: Channel42 on Atlantean, NRPB on Rimor and Ratskeller on DNW. To get information on what is going on in Rubi-Ka I would point new players to the Editor News (German Editor News forum is here), the Beginners Guide to Storyline and Events in AO (German version can be found here) or the Buzz / Rollenspiel subforums. But the most important thing is to keep your eyes open, you never know when you will stumble over one of our Events or Long Term Characters. AOU: Currently both the Council of Truth and the OTRK Board of Directors are suffering from poor attendance. What are your thoughts on possible causes for this and how can this be remedied? Devdas: There are many reasons for this, for starters the general amount of players within AO is not as high as some years ago, therefore there are also less Roleplayers around to participate, then there are many roleplayers that consider such political meetings not as entertaining as others do. Then there are those that don't even know about them, or simply don't have the time to attend due to real live commitments. We are currently observing the numbers very closely to see if we are at a point were we have to make decisions. On DNW we have recently started to increase the numbers of participants again, we even had two, three times as many players showing up then usually on RK1 and 2. The last OAM on RK1 had already quite a good number of people showing up. AOU: By any chance, do you know if the devs will ever finish the Tower of Truth upper floors? Devdas: Devs, plural? But there can be only one Dev! THE Devdas! No, no idea. But personally I don't see it being on there ToDo-List. Devdas: Where ever someone of the Events Team is. Devdas: From the ARK ones I like the Templeview and and floor logo without light the best. From the complete aou collection, the Vanguard and OT-nightwatch are the best. Do you have many RP events planned for this year? Devdas: We are running events all the time. There is very rarely a week without at least one event. And none with not at least one LTC logging in. The up and down of the number of events people perceive can be based on two things: First, sometimes they are lucky and notice many and sometimes they are not lucky. Secondly there are normal seasonal highs and ups in our amount of Events. Right now we are again in the phase of increasing the number of events. How do you plan to include more players in your future RP events? Devdas: We principally include all players in our events, only rarely we have to explicitly exclude griefers. The problem is more that players tend to blatantly ignore our events. occasionally it happens that a worried mother is running around Borealis for an hour before someone plucks up his courage to help her find the missing child. Can we please have more involvement in storyline events..... this gets back to the above question about CoT/BoD.... I was involved in the Investigations by Inspector Malkavie and I thoroughly enjoyed it. Can we have more of this type of Role Playing? Devdas: There is always something going on, some plots require a lot of direct and deep player involvement, some less. Right now there are multiple plots going on and in planning that can only progress if the player solve our riddles. Why are the aliens called Kyr'Ozch? Where is that name derived from? Devdas: This is something everyone has to find out by his own means. Finally, the last few questions. AOU: What is your favorite filling of pie? Devdas: Pie filling? That is this odd American question I never get, right? Pie does not translate unambiguously into German, it can either mean cake or pasty, so I can't answer that question. AOU: Thanks for the interview, any last comments you wish to make Devdas?